Commencement Address given by His Majesty The King at Pacific Lutheran University, Tacoma, 23 May 2015, during an official visit to the US 21 - 27 May 2015. Thank you for another memorable day here in Tacoma and at Pacific Lutheran University. This is my second visit, and I really appreciate to be back in the state of Washington and at this great institution. When the Queen and I visited PLU 20 years ago, she received an Honorary Doctorate – of which I have been informed quite a few times. I am therefore particularly proud to have been awarded an Honorary Doctorate myself. Finally, the Queen and I are equal – at least on your campus. Thank you very much for this great honour. This has been a most enjoyable day: visiting the campus, meeting with students and faculty, and seeing again the rune stone that was erected in 1976 to commemorate the visit of my father, King Olav, the year before. And now; seeing you all here – at such a proud and important moment in your lives. For all of you who are now graduating— today marks the end of a voyage. Yet it is also the beginning of another exciting journey. After all your hard work, you now have your diplomas in your hand. You have reached your first major destination, and for that I would like to congratulate each and every one of you. I have always admired men and women who are dedicated to making a difference, striving for a better life, and seeking to fulfil their dreams. Many Norwegian immigrants to America were such men and women. Pacific Lutheran University is the fulfilment of a dream that Norwegian immigrants brought with them to the Pacific Northwest in the late 1800s. Education was a priority for these immigrants. Starting with very little, they first built their farmhouses, then their church, and then a school. Over the decades, this university has grown to become a proud and acclaimed institution— noted for its commitment to diversity, justice and sustainability, in addition to academic excellence. Dear students, you are all a part of this inspiring history. 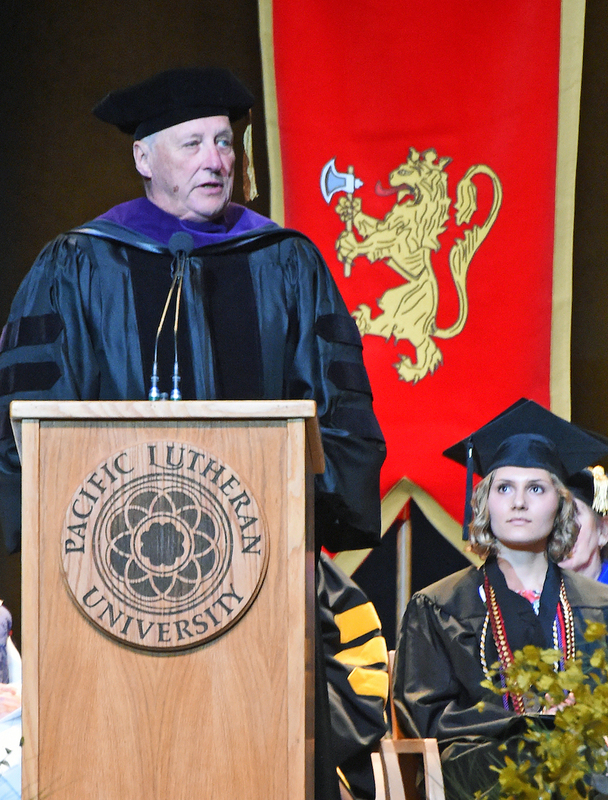 The PLU of today is a testament to the hard work and core values of these first Norwegian immigrants – men like reverend Bjug Harstad, the first president of the university. I would like to commend the previous and the current presidents, the faculty, and the Board of Regents for their work in preserving this history. PLU still has a strong Norwegian profile. This is partly due to the large number of exchange students from Norway, some of which are here today. And it is partly due to the strong links with Norwegian institutions, such as Hedmark University College, Telemark University College and Bjørknes College. The 1700 members of the PLU Scandinavia Alumni Organization will no doubt agree that moving abroad, mastering a second language, and making new friends across borders is a most rewarding and life-changing experience. The fact that over 50 % of PLU students venture abroad, and that you have students from every continent, is a reflection of the institution’s openness to the world. In good times and in bad times, America always attracted some of the world’s best and brightest. Even today, the Dream of America is strong – not least in places where liberty and freedom are constrained. In the period from 1825 to 1925, roughly 800 000 men and women left Norway to seek a better life in America. For a better life for all, we must harness this pioneer spirit in our work to create a better world. First and foremost to find solutions to one of the greatest challenges of our time: climate change. My generation has little to show for itself when it comes to taking care of the environment and our climate. My hope is that your generation will do better. I feel fortunate to have the opportunity to engage with young people like yourselves. Highly motivated young people are already making a difference and pushing their governments to do more. I hope you will take part in raising awareness about the urgency of the environmental challenges that we are facing. You have the power to make a difference. The future belongs to you – take good care of it! I would like to thank you for the warm welcome I have received, once again, at PLU. PLU will always be a part of your lives, but it will also be a part of mine: Through the historical and present day bonds with Norway – and through this honour that you have bestowed upon me today. Thank you – tusen takk!